Team Honda Research West claimed the E1 class victory Sunday in the 11th running of the 25 Hours of Thunderhill, as Acura entries from THRW and Fantasy Junction took three of the top four E1 finishing positions in the challenging endurance contest that concluded the 2013 National Auto Sports Association season. As the checkers flew at the end of 25 hours, during which unseasonably cool temperatures dipped as low as 25 degrees overnight, it was the #27 THRW Acura taking the E1 victory with an eighth-place overall finish, and, a healthy seven-lap margin over a large field that included a trio of works-run Mazda 6 diesel entries. An Acura RSX fielded by the Fantasy Junction team finished second in class, ninth overall, with the second, #25 THRW Acura ILX, fourth. 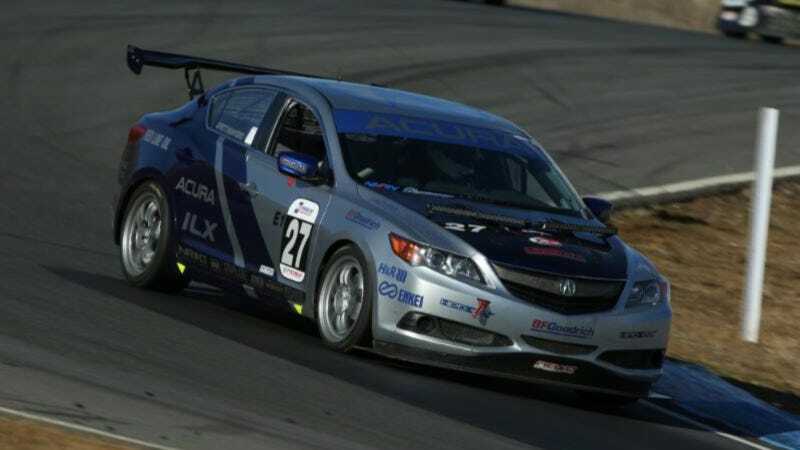 Prior to prevailing on track at Thunderhill, the Acura ILX also recently earned two 2013 Motorists Choice Awards for IntelliChoice and AutoPacific for the premium market segment in the Youthful and Cosmopolitan categories. IntelliChoice and AutoPacific define the "Youthful" winner as a vehicle that "makes you feel young when you own it." While "Cosmopolitan" is defined as a car that "provides prestige or quiet refuge within a city setting." In addition to Acura dominating the E1 results, a Honda CR-Z Hybrid, entered by Japanese tuning company Spoon, produced a strong run in the closing hours to finish third in E2. Meanwhile, a group of Honda Performance Development race engineers and associates finished fifth in the highly-competitive E3 category in a B-Spec Honda Fit entered under the HPD Race Club banner. A total of 57 cars took the green flag at 11 a.m. PDT Saturday for the start of 25 hours of racing around the 2.58-mile, 15-turn Thunderhill circuit, located just outside the northern California town of Willows. The #27 Acura ILX from THRW claimed the early lead with starting driver Scott Nicol, and continued to build its advantage through the afternoon and evening with co-drivers Sage Marie, Lee Niffenegger and Matt Staal. At the halfway mark, Acura's were running 1-2-3 in the E1 class, as the #27 ILX maintained its advantage over the pole-qualifying Acura RSX of Fantasy Junction Racing, with the #25 THRW Acura ILX running third. "It was pretty hectic at the start with all of the [quicker category] ES cars," Nicol said following his stint. "There are a lot of fast ES cars and they come up on you really quick. When you come up to slower traffic and you have the ES cars bearing down on you, you just have to figure out where everyone is going. We have a good strategy. We are looking pretty good, [and] are just optimizing our car as much as we can." THRW is primarily made up of Torrance, California-based associates from Honda R&D Americas, Inc., who work after hours to showcase Honda and Acura products on the track. In addition to the #27 Acura ILX, the identical blue-and-silver #25 ILX was driven by Honda associates Derek Ferretti, Lawrence Hwang, Calvin Liu, Corey Taguchi and Michael Tsay. "It was a great run by the team," Marie said at the finish. "We had a bit of drama here and there, but overall our pace was really good, as you can see from our eighth-overall finish. The BFGoodrich tires had a lot of grip in all conditions, and the Acura ILX is a great race car. The THRW team did an awesome job all weekend." Founded in 1996, Team Honda Research West has a long record of success racing Honda products in both Sports Car Club of America (SCCA) and NASA competition, with more than 60 race victories in a variety of classes. THRW has taken part in all 11 runnings of the 25 Hours of Thunderhill, posting a 1-2 sweep of the E1 class in 2005 while running a pair of Honda Civic Si's in partnership with the Team Honda Research effort based at Honda R&D Americas in Ohio. Finishing fifth in E3 and 29th overall was the B-Spec Honda Fit co-driven by HPD associates Aaron Hale, Tom Grosart, Brian Johnston, Robin Laqui and Tom Reichenbach. The driver lineup for the Spoon Honda CR-Z included former Honda Indy car driver Naoki Hattori and drifting champion Daijiro Yoshihara. Honda Performance Development (HPD), responsible for Honda racing programs ranging from entry-level categories to the IZOD IndyCar Series and World Endurance Championship, contributed several racing-specific components to the ILX project. These included an HPD-lightened flywheel and racing clutch package, limited-slip differential, motor mounts, anti-roll bars and rear upper-suspension control arms. All of these parts are available to racers through the HPD Honda Racing Line program.